The polygonal Geofence tool allows you to create a custom Geofence by connecting three or more dots. 1. Click the ‘polygonal Geofence’ icon at the top of the map. Your cursor will now change to a + symbol. 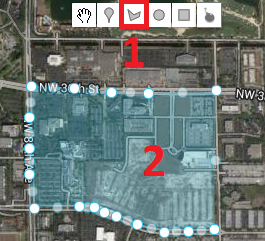 Click where you would like the first point on the Geofence perimeter to be. As you move your cursor, you will notice a line connected to the first point. This line shows where the Geofence perimeter will be. Click where you would like the second point to be. Then click where you would like the third point. Now, you can either complete the Geofence or continue adding points. 2. To close the Geofence, click on the first point one more time. You will then see your Geofence highlighted in blue. You can modify the shape of the Geofence by clicking on any of the points lying on the outer edge and dragging them to the desired shape. You can also move the Geofence by clicking in the center of the Geofence, and dragging it.